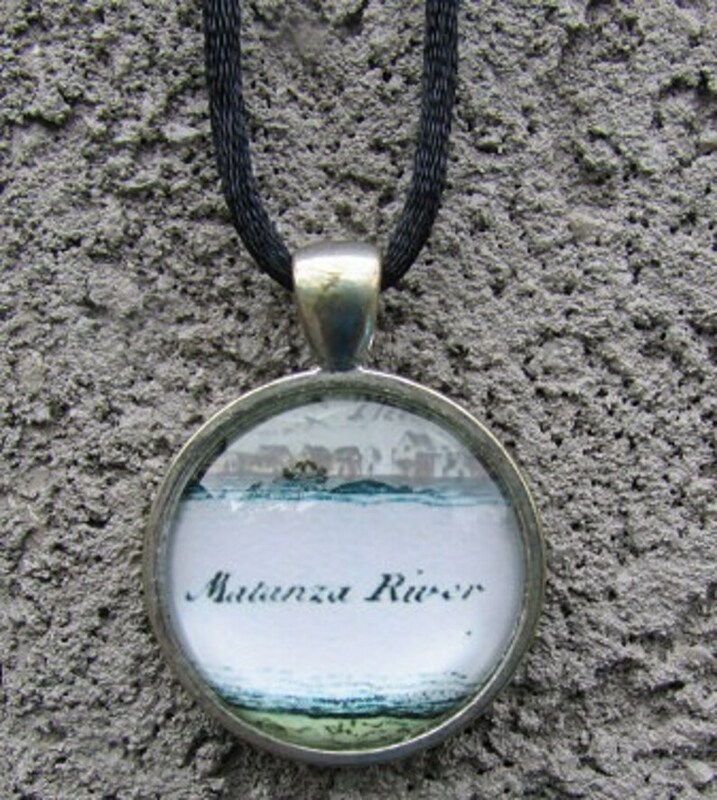 This vintage style necklace features a copy of a historic map of Saint Augustine, Florida (first pic). The map titled, A VIEW of the TOWN and CASTLE of St. AUGUSTINE, and the ENGLISH CAMP was created by Thomas Silver in 1740. 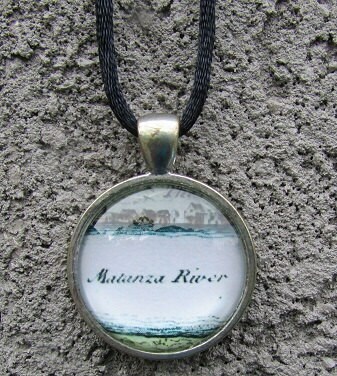 The portion of the map used for this necklace illustrates old town of Saint Augustine and the Matanzas River. All map images are printed onto special paper and fused to the backside of clear glass cabochons. The glass cabochons are then set into pendant trays by using a white resin clay material. The finished glass cabochon is domed shaped and magnifies the image. Necklace pendants are available in three finishes, antique bronze, copper or silver and are available in three different shapes; triangle, circle or square (pics 2-4). The pendants measure approximately 1 inch across and hang from an 18 inch black fabric cord. Circle and square pendant trays have a detailed patterned back while triangle pendant trays are plain. Custom cord lengths are available. Include your custom length in the message box at checkout. All items are made to order and will take approximately 7 days to make. After you place an order you will receive an email with the estimated completion date and ship date. All items are shipped using the USPS flat rate shipping. For local Saint Augustine customers you may choose to pick up your product at the Old City Farmers Market on Saturdays from 8:30 a.m. - 12:30 p.m. Please email me at to arrange. NOTE: The last photo is an example of what a completed necklace looks like. This necklace listing is not for that completed necklace.